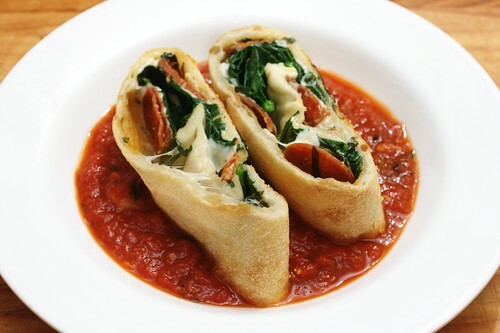 stone fired stromboli with pepperoni, fresh spinach and basil, originally uploaded by aarn! +13th October, 2010+. mixed together 1 1/4t. active dry yeast, 1 1/3c. luke warm water, 1T. salt, 1T. sugar, 2T. extra virgin olive oil, 4T. wheat gluten, and 3c. all-purpose flour (the go-to quick pizza dough recipe). kneaded by hand until it had the right doughy feel. coated the dough in olive oil let sit and rise in a warm place for about an hour (in a bowl, covered in plastic wrap), while the oven and baking stone got up to temperature [425-degrees]. made a quick sauce from a can of crushed tomatoes, some olive oil poached garlic, butter, fresh oregano, basil, and parsley, and tomato paste. seasoned to taste. let reduce until thick but still bright in flavor. cut the dough in half and worked one portion of it into a 12x18-in rectangle on an oiled work surface, using a flat rolling pin (the average thickness was approximately 3/16-in). brushed a mixture of crushed garlic, salt, pepper, oregano and olive oil onto the dough. sprinkled the entire surface of the dough with fresh basil, then thin slices of margherita pepperoni, whole milk mozzarella cheese, and then large leaves of spinach. carefully rolled the dough, starting from the short end. sprinkled a pizza peel with cornmeal and transferred the rolled-up dough to it. slid the roll from the peel onto the clean baking stone, on the bottom rack of a 425-degree oven. let bake for 10-minutes or so, until the top of the dough had a nice brown color. pulled and let cool for 10-minutes so that everything could bind back up on the inside. cut into crosswise slices about 2-in thick and served over the fresh tomato sauce.